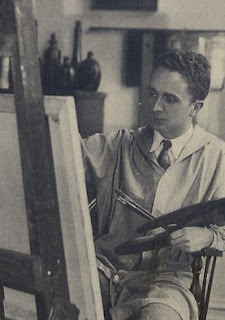 Recently I was thumbing through an old book on Norman Rockwell, I love his work, he was one of the great in his field. 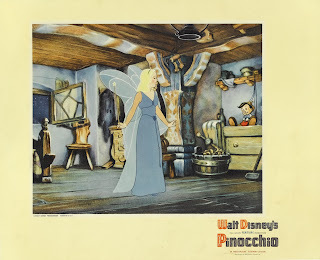 Anyhow, I got to thinking about an article I read a few years back which had a painting reprinted that had been inscribed to Walt Disney. When I was very young I heard the name "Clyde Forsythe" a lot. I believe he was a member of Rancheros Vistadores, and may have brought dad into that group. It was something dad really enjoyed .. that long ride with companions over hill and dale of Santa Barbara County. Norman Rockwell did pencil portraits of my sister and me for dad. We went to dad's office to be photographed for the portraits, as I recall. I was ten, and Sharon seven, so it was in 1943 .. or 44. Rockwell had sent dad one of his original Saturday Evening Post covers .. the Girl reading a Magazine one. We were all very excited about it, but I can't remember if the Post cover came before our portraits. Dad was invited to come to Rockwell's studio to pick out the cover of his choice, but couldn't spare the time to do it .. I remember this discussion at home .. so sent someone else to do it. This might have been Forsythe. I learned from a woman who was doing research for a book on Rockwell for the museum that Forsythe was a cartoonist, and that he and Rockwell had shared a studio at one time. She contacted me because she wanted to know more about the relationship between the two men, too. We have copies of a letter dad sent to Rockwell thanking him for the gift. "All the fellows are coming up to my office to see it .. " something like that. Rockwell's studio burned down sometime around this.. and art and letters were lost. The Post cover and our portraits hung in dad's office. After his death Sharon and I had our respective portraits in our own homes, and the cover was in our family office (Retlaw Enterprises).After my mother's death in December of 1997 .. 2 months short of her 98th birthday .. we closed the family office, and I took possession of the cover for a time. 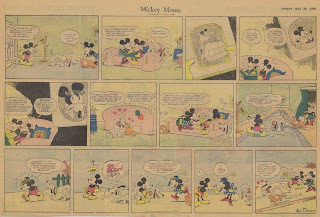 It is inscribed "To Walt Disney, one of the truly great artists, from an admirer, Norman Rockwell." Ron and I visited the (Rockwell) museum in the Berkshires .. it was a lovely trip . . . and I decided that our painting belonged there, and that's where it is now .. on a sort of permanent loan.
. . . .There is an incident described which must be the first meeting between the two men. My parents are driving through New England with Hazel and Bill Cottrell. Hazel was my mother's sister, and Bill a long time colleague of dad's (and a dear uncle ). When they come upon Rockwell's studio, maybe by chance, or by design, dad wants to stop and meet the master. Rockwell's staff has been instructed to not admit casual visitors, so dad is turned away. Rockwell happens to see him leaving, and runs out the door to meet him. It all sounds very plausible. Dad was a very spontaneous guy. He would see nothing amiss in just dropping in on someone. What a great story, what a great scene. Thank you very much to Diane for sharing that story with me. 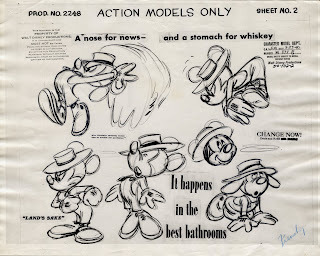 Here's a piece I just acquired, it's a trade ad from the RKO EXHIBITOR'S BOOK. 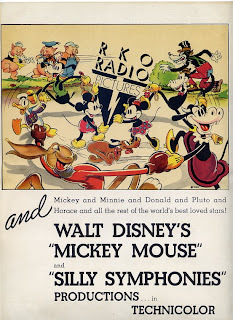 RKO was Disney's distributor from 1937 - 1953 with the exception of VICTORY THROUGH AIR POWER (1943) which was released through United Artists, Disney's previous distributor before RKO. 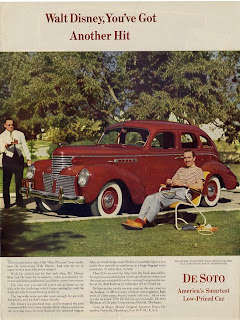 It's interesting to note that DeSoto were the sponsors of Groucho Marx's YOU BET YOUR LIFE series. 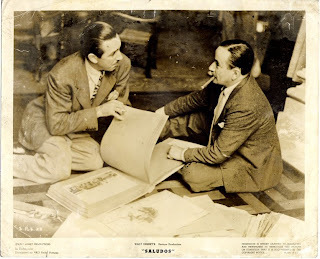 I'm just as excited as everyone else about Ted Thomas' new film Walt & El Grupo, with that in mind I thought I'd share this publicity photo for Saludos Amigos I recently acquired. The photo is very grainy and looks to me like a frame blow up from the 16mm footage that was incorporated into the movie. Finally I got the image up, better late than never I guess. 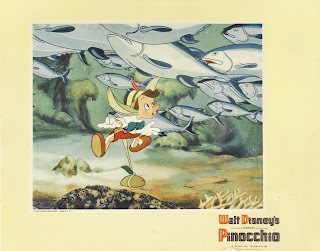 These fine lobby cards from the original release of Pinocchio were sold on e-bay early last year. 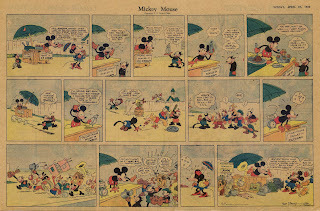 How the art of movie promotion has changed. 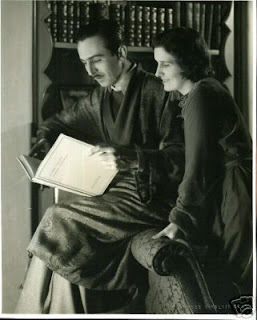 Here's a great portrait of Walt and Lilly, by Clarence Sinclaire Bull which recently sold on e-bay. 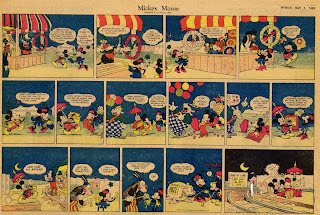 For anyone waiting for a Mickey Sunday, I'm sorry for the delay but I am having trouble uploading images at the moment, hopefully it'll be resolved soon. 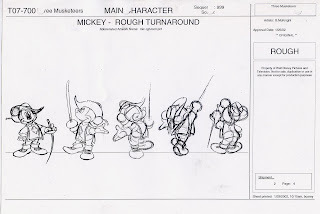 In August 2002, along with two other artists Marc Camelbeke and Shawn Colbeck, I was pulled from layout duties on LION KING 1 1/2 to start workbooking THE THREE MUSKETEERS with Mickey, Donald and Goofy. This was a dream come true in a way, a chance to draw the classic characters. We were given a really strong model pack which was unusual, normally we got poor re-traces of feature models. 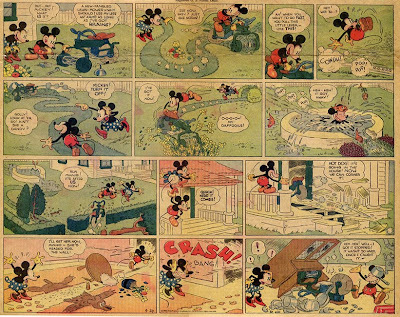 My supervisor and friend Steve Lumley brought in some photocopies of classic Mickey models which were a great guide. 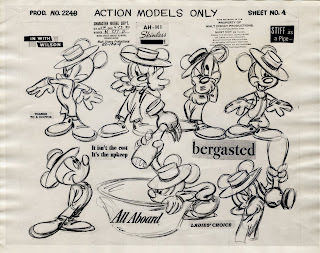 In the meantime I scoured e-bay looking for original Mickey models and these great Fred Moore examples which I copied for the rest of the time and had pinned up on my wall for the duration. 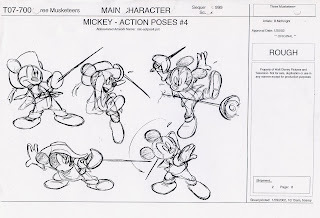 Mickey is surprisingly difficult to nail, it's not only drawing him but getting the personality into the drawings. 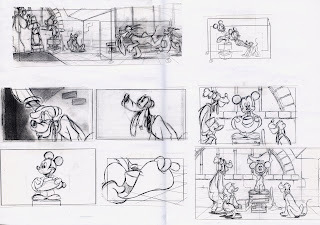 These videos were really just meant to be pushed out so not much time was allocated to preparing for a project, we really had to learn as we went along as this example of a rough workbook I did will testify. Ultimately the one real disappointing thing about the project (apart from being cut to shreds in the final edit) , was how the powers that be messed with the personalities especially Donald who was always my favorite and in this picture become a 100% coward not prone to angry outbursts.